Depression, recession, inflation....welcome to the depressing world of the American farmer as voiced by John Fluker (also occasionally credited as John Fulker), now a respected Christian/R&B musician but once one of the many vocalists who plied their trade in the song poem studios. 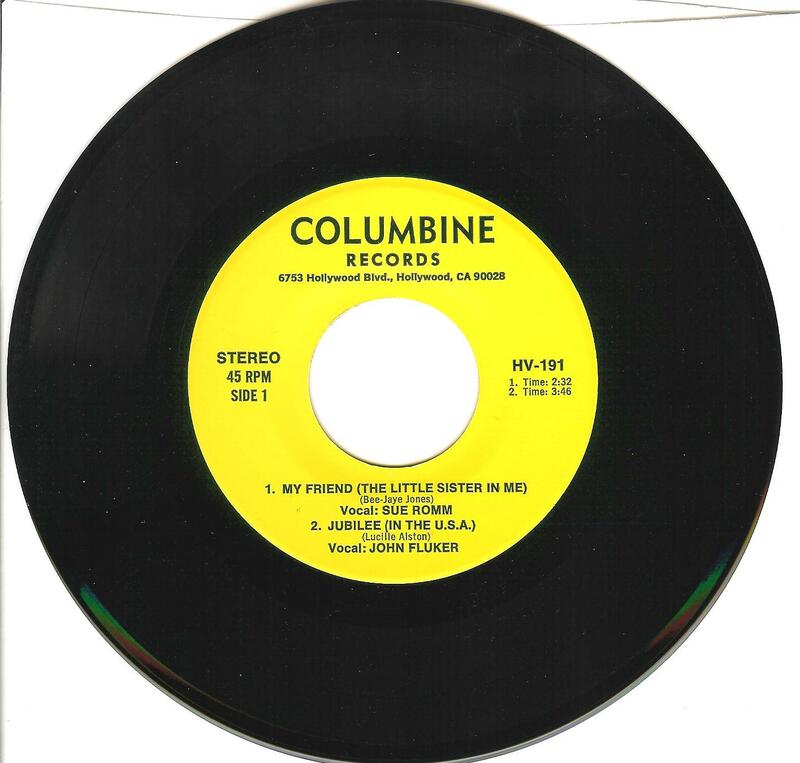 Fluker is a graduate of the University of Michigan School of Music where he studied voice and piano, although I'm guessing that he paid for his studies by recording dozens of mediocre musical monstrosities for the Columbine company. As musical director and accompanist for Gladys Knight, John has traveled the world even visiting Oslo, Norway for a performance during the 2005 Nobel Peace Prize awards. His collaboration on the 2006 Grammy winning One Voice: Gladys Knight & The Saints Unified Voices included "Did You Know", a duet with Gladys, as well as co-arranging several tracks on the album. He's produced recordings for other artists as well as releasing several albums in his own right - in fact our man has come a long way since singing the drivel I present for you today, Jubilee (In The USA) by the little known Lucille Alston, author of the equally dreadful The Tree Of Eternal Life on Hollywood Artists. I love this record, it has just about everything a really bad record should have: inept vocals, stupid and often nonsensical lyrics (John insists in singing the line 'when we will ever learn' instead of the obviously correct 'when will we ever learn', for example), a ropey accompaniment and an appalling production. It's just ace, and I hope you enjoy it as much as I do! A special post this week, a three-for-one offer just for you in celebration of the notorious American war criminal Lieutenant William Calley, the army officer found guilty of ordering the My Lai Massacre on March 16, 1968, during the Vietnam War. Exactly the right sort of subject for a hit single or two, surely? Or three. 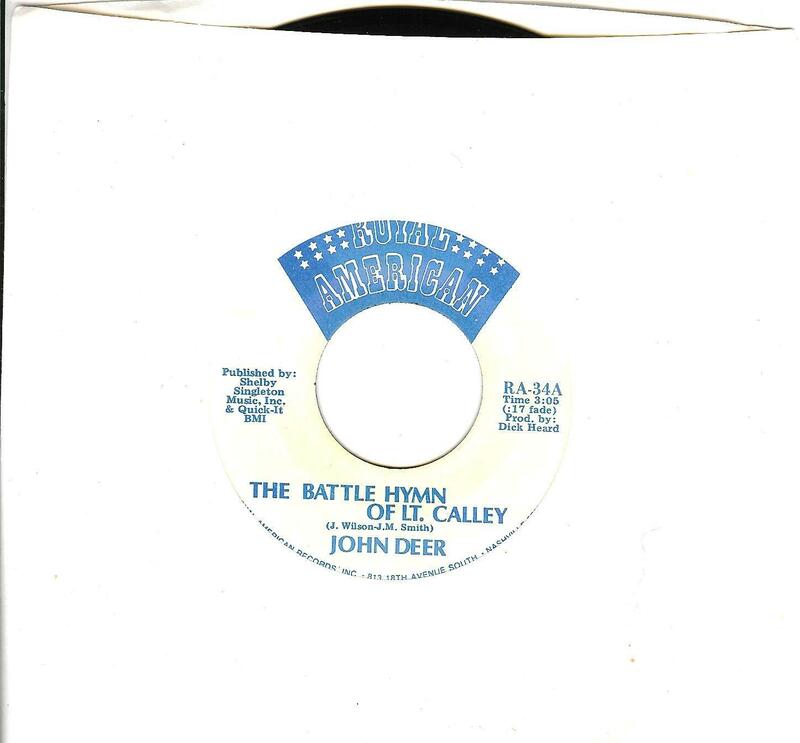 For today's selection not only features an execrable rewrite of John Brown's Body in that dreadful Staff Sergeant Barry Sadler style, but two song-poems from the Preview stable, both performed by the always reliable Gene Marshall (aka John Muir, real name Gene Merlino). 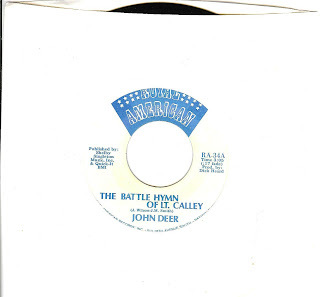 The John Deer recording on Royal American is particularly interesting because it is, in fact, a cover version of a single released in 1971 by the group C-Company Featuring Terry Nelson (an Alabama-based radio DJ), which sold over two million copies and hit number 37 on the US Billboard charts. Unsurprisingly, neither of the Gene Marshall recordings troubled the charts. I love the way in which the songwriters have tried to create a folk hereo out of this man - if you don't know the Calley story, you can read all about it here, including the tale of the revolting man's feeble attempts to con money out of the British media, but for now enjoy! I found this little gem on another site (thank you so much Jukebox Mafia) and felt compelled to share it with you. After listening to Mike Deasy singing God Hates Queer (sic) I'm sure you'll understand why. What I found most amazing, or possibly troubling, about the religious zealot's tirade was discovering the number of records in my own collection that the man who declares himself 'one of the most recorded guitarists in the history of music' has appeared on: virtually the entire Monkees' discography, classic albums by the Beach Boys, Simon and Garfunkel, Tiny Tim, Ella Fitzgerald and others. 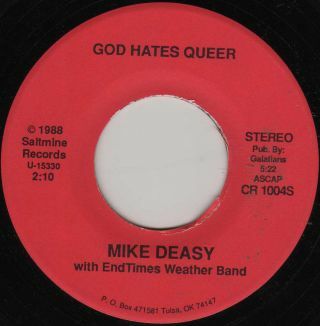 Unsurprisingly God Hates Queer is notable for its absence from the god-bothering Mike Deasy's own discography (you'll find that here). These days Mike makes most of his money from pandering to America's ever-growing Christian Music audience through touring, preaching the good word via his Mike Deasy Ministries programme and recording dreadfully anodyne paeans to the old man in the white beard who lives in the sky. Pleasingly, for fans of the ridiculous and for those of us who like our saviour supporters to have a bit of Jim and Tammy Bakker about them, the man is also running his own song-poem outfit. Saltmine records not only produce tracks by Mike and his missus Kathie but will, for a fee of $100, put your poem to music - and for a further $250 record a demo for you. How generous. I wonder how much of that ends up in the collection plate? 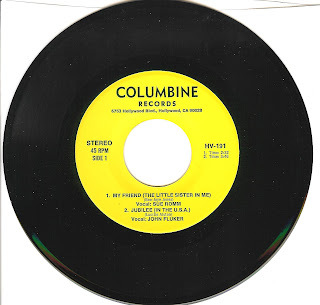 Unfortunately there is no composer credit on the label for God Hates Queer so we'll never know for sure if Mike wrote it himself or if it was submitted to his song sharking enterprise, although the latter is doubtful. Every other song-poem record which has ever been pressed credits the songwriter; what would be the point otherwise? Mike, you may want to forget this little slice of bigotry, but I'm afraid the World's Worst Records feels obliged to out you.